Comedian will begin comedy tour featuring top male comedians. 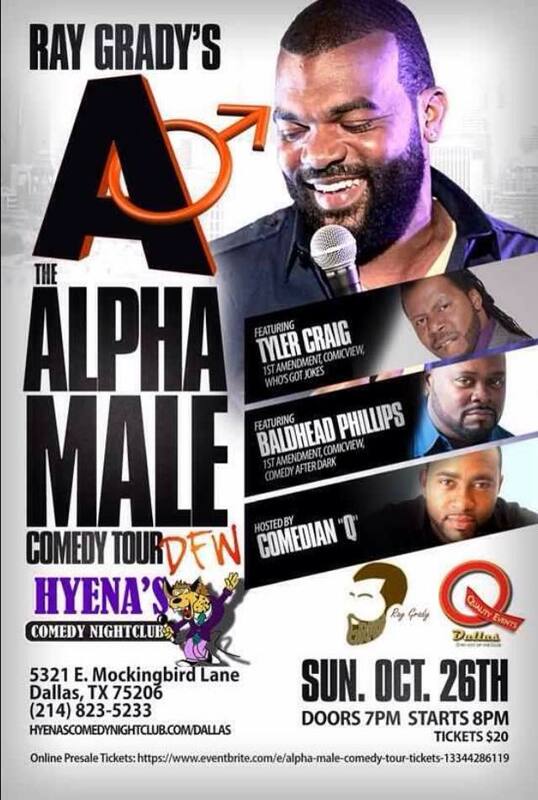 LOS ANGELES - Oct. 15, 2014 - PRLog -- Comedian, Ray Grady is launching his Alpha Male Tour in Dallas, TX at Hyena’s Comedy Nightclub on October 26, 2014. The tour will feature fellow comedians, Baldhead Phillips, Comedian “Q” and Tyler Craig. Having toured with some of the industry’s biggest names, including: Corey Holcomb, Tony Rock and Mike Epps, Ray Grady is ready to launch his own tour, saying "I came up with Alpha Male Comedy Tour about 4 years ago. We had a few trial runs, but now I feel we are in a place to kick it off in the right way, so I'm excited!" The comedian can recently be seen on this season of BET Comic View that aired on September 30th. His performance got rave reviews by fans saying that he has “Hilarious material and impeccable timing” and “Truly, Ray Grady had one of the best sets, hands down.” Re-runs of the episode can be found on BET or online at www.bet.com. To purchase tickets for the Alpha Male Tour, visit: http://www.eventbrite.com/e/alpha-male-comedy-tour-tickets-13344286119. Please contact Tiffany Hubbert at tiffany@raygrady.com for all bookings. To learn more about Ray Grady and upcoming projects, follow him on Twitter and Instagram @GradyComedy and on Facebook (http://www.facebook.com/RayGradyComedy). Ray Grady is a Comedian/Actor that has been in the business for over 10 years. His comedy has been featured on TV One's “Who's Got Jokes,” Starz "Martin Lawrence Presents: First Amendment," BET's "One Mic Stand" and more. He has also been featured on TV One's sitcom "Love That Girl" and recently participated in the CBS Diversity Sketch Comedy Showcase. Visit his website at http://www.raygrady.com.